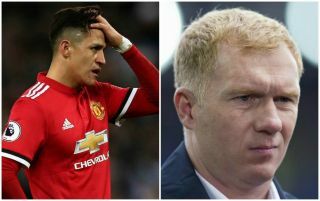 Manchester United legend Paul Scholes says it was almost ‘scary’ how much Alexis Sanchez gave the ball away in today’s FA Cup final defeat to Chelsea. The Red Devils were far from at their best at Wembley this afternoon as they conceded a sloppy penalty to Eden Hazard in the first half and failed to really carve out any genuine chance of an equaliser. Paul Pogba’s sitter was perhaps United’s best chance, and Scholes was not impressed by some of Jose Mourinho’s decisions afterwards. Most notably, the former England midfielder took issue with the Portuguese hooking off Marcus Rashford and Jesse Lingard when Sanchez was allowed to continue on. The Chilean has struggled since joining United from Arsenal in January and he was poor again today, with Scholes singling him out for criticism for losing the ball so much. ‘The only thing that was lacking was that bit of quality in the final third, Sanchez, how many times he gave the ball away was scary really, and he’s a top class player, he’s not really done it for United yet,’ Scholes told BT Sport, as quoted by United Xtra. United finished 2nd in the Premier League, an improvement on last season, but will be disappointed to have ultimately ended the campaign without a trophy.